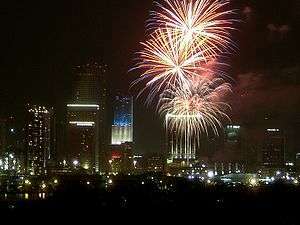 Celebration with fireworks over Miami, Florida, USA on American Independence Day. Bank of America Tower is also lit with the red, white and blue color scheme. Color schemes are used to create style and appeal. Colors that create an aesthetic feeling when used together will commonly accompany each other in color schemes. A basic color scheme will use two colors that look appealing together. More advanced color schemes involve several related colors in "Analogous" combination, for example, text with such colors as red, yellow, and orange arranged together on a black background in a magazine article. The addition of light blue creates an "Accented Analogous" color scheme. Color schemes can contain different "Monochromatic" shades of a single color; for example, a color scheme that mixes different shades of green, ranging from very light (white), to very neutral (gray), to very dark (black). Use of the phrase color scheme may also and commonly does refer to choice and use of colors used outside typical aesthetic media and context, although may still be used for purely aesthetic effect as well as for purely practical reasons. This most typically refers to color patterns and designs as seen on vehicles, particularly those used in the military when concerning color patterns and designs used for identification of friend or foe, identification of specific military units, or as camouflage. A color scheme in marketing is referred to as a trade dress and can be sometimes be copyrighted, as is the pink color of Owens-Corning fiberglass. Color schemes are often described in terms of logical combinations of colors on a color wheel. Different types of schemes are used. Monochromatic colors are all the colors (tints, tones, and shades) of a single hue. Monochromatic color schemes are derived from a single base hue, and extended using its shades, tones and tints (that is, a hue modified by the addition of black, gray (black + white) and white. As a result, the energy is more subtle and peaceful due to a lack of contrast of hue. For the mixing of colored light, Newton's color wheel is often used to describe complementary colors, which are colors which cancel each other's hue to produce an achromatic (white, gray or black) light mixture. Newton offered as a conjecture that colors exactly opposite one another on the hue circle cancel out each other's hue; this concept was demonstrated more thoroughly in the 19th century. The split-complementary (also called Compound Harmony) color scheme is a variation of the complementary color scheme. In addition to the base color, it uses the two "Analogous" colors adjacent to its complement. Split-complementary color scheme has the same strong visual contrast as the complementary color scheme, but has less pressure. 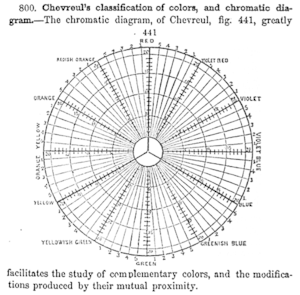 Any color that lacks strong chromatic content is said to be'unsaturated, achromatic, or near neutral'. Pure achromatic colors include black, white and all grays; near neutrals include browns, tans, pastels and darker colors. Near neutrals can be of any hue or lightness. Neutrals are obtained by mixing pure colors with white, black or gray, or by mixing two complementary colors. In color theory, neutral colors are colors easily modified by adjacent more saturated colors and they appear to take on the hue complementary to the saturated color. Next to a bright red couch, a gray wall will appear distinctly greenish. Black and white have long been known to combine well with almost any other colors; black decreases the apparent saturation or brightness of colors paired with it, and white shows off all hues to equal effect. Analogous colors (also called Dominance Harmony) color scheme are groups of colors that are adjacent to each other on the color wheel, with one being the dominant color, which tends to be a primary or secondary color, and two on either side complementing, which tend to be tertiary. The term analogous refers to the having analogy, or corresponding to something in particular. An analogous color scheme creates a rich, monochromatic look. It’s best used with either warm or cool colors, creating a look that has a certain temperature as well as proper color harmony. While this is true, the scheme also lacks contrast and is less vibrant than complementary schemes. An accented analogous complementary scheme utilizes related hues lying adjacent on the color wheel with a hue directly opposite to these. This direct complement becomes the accent color, used to create a dominant color grouping of three similar colors accented with the direct complement (or the near complement) of one of them. The complementary accent color creates an interesting contrast against the dominant color grouping. This scheme is frequently used to put a warm accent color with a cool analogous color pallet, or a cool accent color with a warm pallet. The triadic color scheme uses three colors equally spaced around the color wheel. The easiest way to place them on the wheel is by using a triangle of equal sides. Triadic color schemes tend to be quite vibrant, even when using pale or unsaturated versions of hues, offers a higher degree of contrast while at the same time retains the color harmony. This scheme is very popular among artists because it offers strong visual contrast while retaining balance, and color richness. The triadic scheme is not as contrasting as the complementary scheme, but it is easier to accomplish balance and harmony with these colors. The tetradic (double complementary) colors scheme is the richest of all the schemes because it uses four colors arranged into two complementary color pairs. This scheme is hard to harmonize and requires a color to be dominant or subdue the colors. ; if all four colors are used in equal amounts, the scheme may look unbalanced. The rectangle color scheme uses four colors arranged into two complementary pairs and offers plenty of possibilities for variation. Rectangle color schemes work best when one color is dominant. The square color scheme is similar to the rectangle, but with all four colors spaced evenly around the color circle. Square color schemes works best when all colors are evenly balanced. The term polychromatic means having several colors. It is used to describe light that exhibits more than one color, which also means that it contains radiation of more than one wavelength. The study of polychromatics is particularly useful in the production of diffraction gratings. ↑ Gordon V. Smith and Russell L. Parr (2005). Intellectual Property: Valuation, Exploitation, and Infringement Damages. John Wiley and Sons. ISBN 0-471-72433-5. ↑ Jackie Shaw (1994). The Big Book of Decorative Painting: How to paint if you don't know how – and how to improve if you do. Watson–Guptill. ISBN 0-8230-0265-9. ↑ Edith Anderson Feisner (2006). Colour: How to Use Colour in Art and Design. Laurence King Publishing. ISBN 1-85669-441-0.